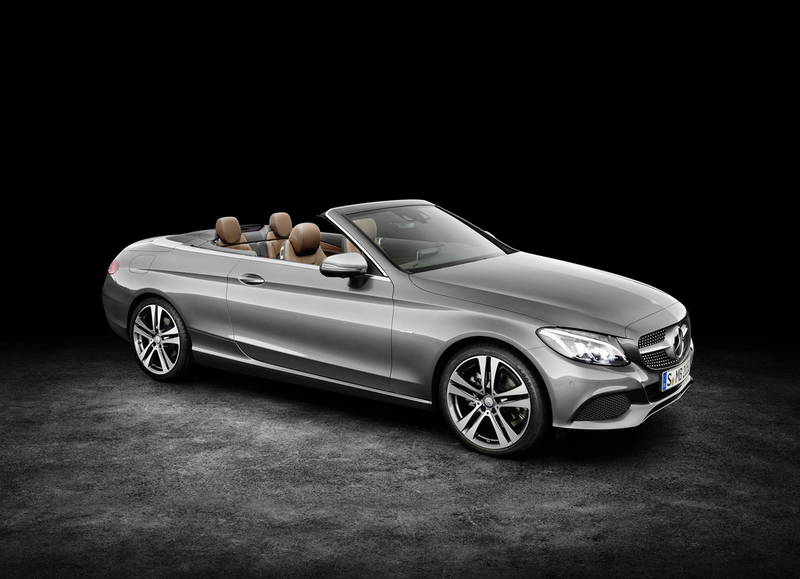 The new Mercedes C-Class Cabriolet is available to order now, priced from £36,200 OTR. 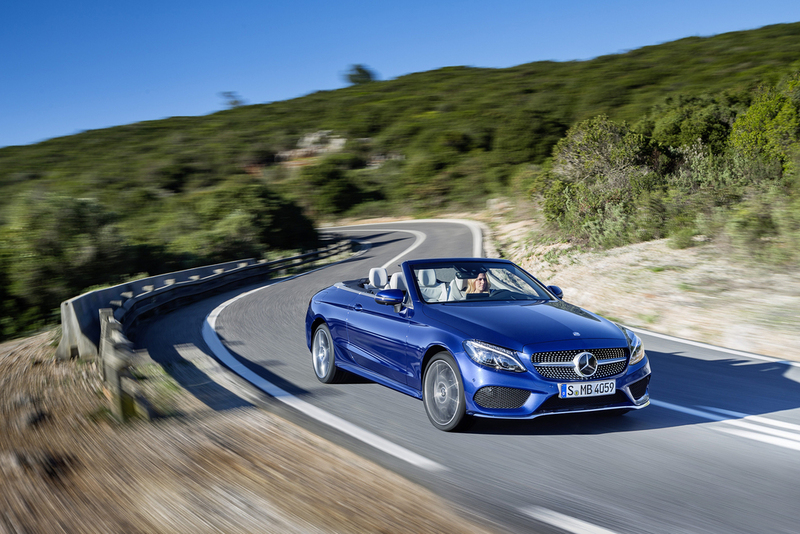 The C-Class Cabriolet comes in two trim lines, Sport and AMG Line, and with a choice of six engines. The range starts with the C 200 (£36,200) which has a 2.0-litre (184 hp) petrol engine and delivers 47.1 mpg on the combined cycle. It is available with either a six-speed manual or 9G-TRONIC nine-speed automatic transmission. The C 300 (from £40,615 ORR) features the same 2.0-litre engine with a higher output of 245 hp, and offers up to 42.2 mpg on the combined cycle, and is available only with the 9G-TRONIC gearbox. The Mercedes-AMG C 43 4MATIC Cabriolet costs from £50,160 OTR and is powered by a 3.0-litre bi-turbo V6 petrol engine producing 367 hp. It can sprint from standstill to 62 mph in 4.8 seconds. 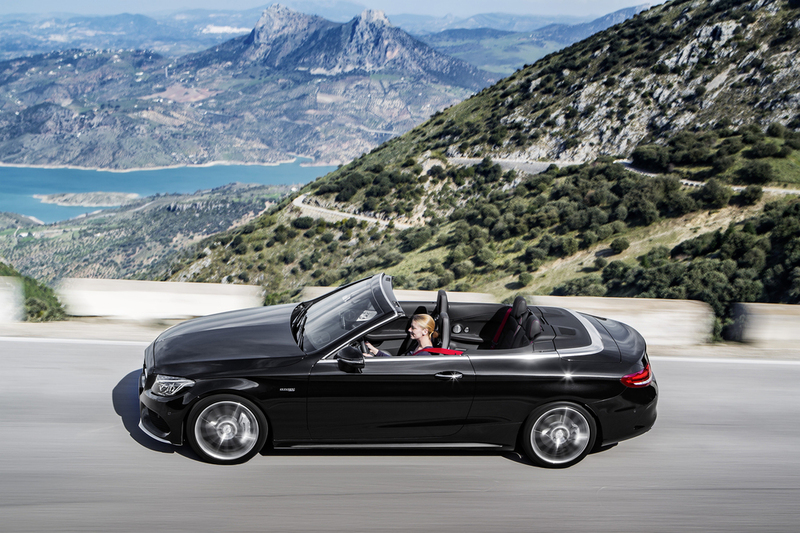 The C 43 comes with a 9G-TRONIC nine-speed automatic gearbox as standard, with an adapted shift programme. Two diesel engines are available: the 170 hp C 220 d (available in both rear-wheel and four-wheel drive), with a six-speed manual (rear-drive only) or 9G-TRONIC nine-speed automatic gearbox; and the C 250 d, which produces 204 hp and comes with a 9G-TRONIC gearbox. There is a choice of four colours for the electrically-operated multi-layer acoustic soft-top (which can be raised or lowered up to 31 mph): black; dark blue; dark red; and dark brown. Each is available as a no-cost option. Two model lines are available: Sport and AMG Line. Standard equipment includes Airscarf; Aircap; Memory Package; reversing camera; keyless start and entry (auto only); Garmin Map Pilot navigation system; Mirror Package; heated seats; Active Parking Assist; Agility Control comfort suspension; LED headlights; ambient lighting (auto only); DAB radio; and sports seats in Artico leather. The Sport model comes with a gloss black interior trim with brushed aluminium, 17-inch alloy wheels and a diamond grille with black-painted pins. For a £1,495 price increase over Sport, AMG Line includes black ash wood trim with brushed aluminium; an AMG sports steering wheel with flat bottom; brushed steel sports pedals and a black roof lining. The exterior features an AMG bodystyling kit; 18-inch five-spoke alloy wheels; a diamond grille with chrome pins and 15mm lowered sports suspension. The Mercedes-AMG C 43 adds 18-inch alloys with five-spoke design; AMG performance exhaust system; brake pads with ‘AMG’ lettering; Artico and Dinamica upholstery; black mirror housings; and ‘BITURBO 4MATIC’ lettering on the front wings, as standard. The range-topping Mercedes-AMG C 63 Cabriolet costs £65,685. With a 4.0-litre bi-turbo V8 engine and AMG Speedshift MCT 7-speed automatic gearbox, the C 63 produces 476 hp and 650 Nm, and can accelerate from 0 to 62 mph in 4.2 seconds. The £72,245 Mercedes-AMG C 63 S produces 510 hp and 700 Nm, with zero to 62 mph taking 4.1 seconds. Standard equipment on the C 63 Cabriolet includes: AMG steering wheel in Nappa leather; Nappa leather upholstery; AMG performance exhaust system; spoiler lip (in vehicle colour); and ‘V8 BITURBO’ lettering on the wings. The C 63 S adds: AMG performance seats (£1,405 option on C 63); AMG steering wheel in Nappa leather and Dinamica; 19-inch alloys; an electronic rear-axle limited-slip differential. As with the C-Class Coupé, a limited-edition C63 S Edition 1 is available from launch. It features unique details including diamond-stitched nappa leather upholstery in black and brown; matt carbon fibre interior trim; bespoke 19-inch front and 20-inch rear wheels, and is available for £78,295. First UK deliveries will arrive in September.